My first reaction upon reading a constitutional amendment had been pre-filed to lower the voting age in Missouri to age 16 was one of a flashback to a movie from 1968. Wild in the Streets was a Boomer cult classic. It’s a hippie exploitation film in which the voting age is lowered to 15 and then 14, young people take over, and everyone over 35 years is forced into re-education camps to be medicated 24/7 with LSD. Long before MTV, there was Wild in the Streets and the very first Rock the Vote Rally. The voting age was lowered to age 18 in 1971 by the 26th Amendment, and nothing dramatic really happened. Young people did not take over. I don’t know what State Rep. Karla May’s reasoning is for HJR 16 to lower the voting age to 16 years. I’m sure there’s something positive in this that I haven’t figured out yet. But at the moment I am only seeing unintended consequences that cause me to say, no, please, do not do this. A major reason for lowering the voting age from 21 to 18 was The Draft. The age for The Draft was lowered from 21 to 18 in World War II and this gave birth to the “Old Enough to Fight, Old Enough to Vote” movement. If the voting age is lowered to 16, then the age for Draft registration and volunteering for military service should also be age 16. The legal age to marry without parental consent in most states is age 18. If you are mature enough to vote at age 16, then you are also mature enough to marry. The legal age to enter into contracts in most states is age 18. If you can legally contract a marriage at age 16, then you should also be allowed to sign a contract in your own name for a credit card, apartment lease, or a car loan. Finally, in most cases today, a juvenile is not tried as an adult for his or her crimes and children are not incarcerated with adults. If 16 and 17 year olds have the moral and cognitive capabilities to vote, it stands to reason they are also mature enough to be tried and sentenced as adults for crimes. I would argue that children should not be tried as adults, should not be able to contract for marriage or anything else, should not be sent to war and, therefore, are not entitled to the right and responsibility of suffrage. I do not have problem with elected officials endorsing candidates before filing has closed. You make an endorsement in your own name. You’re not beholding to a group if you do not wish. Your name and whatever political capital it brings is your own to share or withhold. Me, I wait for a vote by my membership. That’s my thing. It’s not better or worse than what others do. It’s just how I roll. I founded an open ward organization where members vote on endorsements. My endorsement goes with the 7th Ward Independent Democrats endorsement. In the case of the 7th Ward Alderman vacancy and Board President race, my endorsement will come after our 7th Ward Primary Candidate Forum/Debate (7 pm Monday, January 19th at Lafayette Park United Methodist Church) and our 7th Ward Endorsement Election Happy Hour (5:30-7 pm Tuesday, February 3rd at Sassy JAC’s, 1730 S 8th). That’s how I do it. Some committee people also wait for their ward organization members to endorse. Others do not. Some have ward organizations without members. They exist on paper for campaign finance reporting purposes. There’s no uniform ward organization template in St. Louis City. Aldermen, State Legislators, and Citywide Officials, of course, are free to make an endorsement any time they darn well choose. Me, personally, with or without a ward organization, I’d want to see who files, particularly in an open primary, before I made a commitment. But that’s just me. It’s my thing. I respect that other electeds have their own thing. Sam Cummings does not represent the 7th Ward Independent Democrats. He’s a member but no longer an officer. Sam Cummings appears to have a beef with some elected officials who have already endorsed Jack Coatar or Chelsea Merta for 7th Ward Alderman. I take that to mean he is either getting in the race or using his ridiculous #NoEthics #NoDemocracy #HiddenAgenda #Corrupt claims as an excuse for not filing. One of the problems I have with Sam Cummings’ Pre-Filing Deadline Endorsement Conspiracy Theory is consistency. He’s fine with officials endorsing in the Board President race before filing closes. I’m waiting for my ward organization to make the endorsement but I’m not cranky over elected officials already throwing their names behind the re-election of President Lewis Reed. Sam Cummings also does not appear to take issue with organizations, such as Labor or Business organizations with PACs, who do not wait until filing closes to make endorsements. They get a pass in his novel definition of ethics, democracy, and corruption. As conspiracy theories go, his is not very well developed. Friday, January 2nd is the Filing Deadline for 7th Ward Alderman, Aldermen in even-numbered wards, and President of the Board of Aldermen. Here is some information on filing for alderman. As I have said before, I am really looking forward to a robust debate by candidates for 7th Ward Alderman, be they two candidates or twelve. I have no control over other organizations, but I pledge to make sure that the 7th Ward Independent Democrats Candidate Debate is not about early endorsements. We don’t need a Civilian Review Board. The time has come and gone for that. We need radical change. And by radical, I mean empowering voters to change policing in St. Louis City and, maybe by example, the nation. I propose that we democratically elect a body to run the St. Louis City Peace Department, formerly known as the Police Department. The St. Louis City Peace Commission shall have seven Commissioners elected by voters from Peace Commission Districts. Each District shall be equal to four current wards. After 2020 redistricting, when we drop to 14 Wards, each Commission District shall be equal to two wards. The Commission shall be the head of the St. Louis City Peace Department. Commissioners shall set overall policy and goals for the Department and hire a Chief Peace Officer to manage the daily operations of the Department; the training facility to be known as the Peace Officers Academy; implement the Commission’s policies, and achieve the Commission’s goals. Peace Commissioners shall be a full-time salaried positions and no other employment or business undertaking shall be conducted while serving on the Commission. Qualifications shall include a minimum age; a minimum number of years as registered voter in the City of St. Louis; and no income taxes, personal property taxes, or fees owed to the Federal, State, or St. Louis City governments on property in the candidate’s name or in the name of any business that the candidate has ownership. Candidates shall disclose their family relationships with employees of the St. Louis City Peace Department within the fourth degree. Commissioners shall make an annual filing on same. Commissioners shall be elected by partisan ballot in Primary and General Elections held at the same time as statewide elections. Terms would be four years without term limits. Odd numbered districts and even-numbered districts would be elected in different years. Vacancies shall be filled by the St. Louis Mayor to serve out the term. A Commissioner may face a recall election upon signatures from 15% of the registered voters of the Peace Commission District. In the event of a successful recall vote, a special election shall be held to fill the vacancy. Commissioners shall elect a Chairman of the Peace Commission from among their members. The City’s Earning’s Tax shall be earmarked for the Peace Department and related expenditures by the Peace Commission, such as crime prevention programs. Each year, the Chief Peace Officer shall submit to the Commission a budget for the Peace Department and the Commission shall adopt or amend it after public hearings. The Peace Commission shall be empowered to send bond and tax issues to the voters at the same time as statewide elections. Any decision by the St. Louis City Peace Department’s Internal Affairs Office may be appealed to the Commission. All shootings by peace officers in the employ of the St. Louis City Peace Department resulting in loss of human life shall be investigated by the Commission. And we shall also remove the paternalistic prohibition on our public employees, including peace officers, which excludes them from full use of their First Amendment rights and limits their participation in the democratic process. Preventing politics on the job does not require censorship of public employees when they are not on the job. Now, I’m aware that this would take some action by the Missouri General Assembly and there are numerous parties ensuring it never stands a chance in Jefferson City, such as Rex Sinquefield and St. Louis Police Officers Association. So, if we want real change, we’re going to have to do something more constructive than protest. We have to bypass the Legislature and beat Sinquefield at his own game. We have to collect petition signatures across Missouri for a well written initiative ballot issue to create the St. Louis City Peace Commission. We have to find every person who agrees the system has to change, make sure they are registered to vote, and get them to the polls. It has to be a disciplined, thoughtful, grassroots campaign for a specific goal. If not the goal of a Peace Commission to run the Peace Department, something else. Or you can go right on protesting and patting yourselves on the backs for shutting something down. Who Is Fact Checking The Ferguson Commission? Edited 12/17/2014 because a new fact, maybe, maybe not, was brought to my attention. Last night, there was this in my Twitter Timeline, a quote from one of the Ferguson Commission panelists. It was retweeted fifteen times. Problem is, it’s not true. The Commissioner was only off by 103. The United Nations has 193 member nations. St. Louis County has 90 municipalities. And this is how we came to know that St. Louis County has more municipalities than any county in the country. It, also, is not true. Cook County has 132 municipalities. But somebody with a title said it years ago and then it was repeated and now accepted as true. @stlouist @stl7thward Well, the correct line was "We have more elected officials in our region than there are Representatives at the UN"
It suggests that a member of the Ferguson Commission has a critical thinking skills deficit. Comparing the United Nations to a Missouri county. Comparing local elected officials, most unpaid, with international diplomats appointed by heads of state. Really? Seriously? 7th ward Independent Democrats has given up on Facebook and now has its own blog for information on events, membership, fundraising, endorsements. That’ll free up this space to be nothing but the committeewoman’s blog. This is what’s wrong* with St. Louis. I am supposed to be at a party right now. Instead, I am writing about why I am not there. We received an electronic invitation to an annual holiday party. One of the hosts is known for his political incorrectness, an equal opportunity offender. This year’s invitation, however, crossed the line and then some. Weeks later, the invitation was revised. It got worse, horribly worse. Those Reply Options include: Torch & Pitchfork, Looking For Riot Gear, No Time To Burn. For me, far more offensive than the invitation was what came with it. 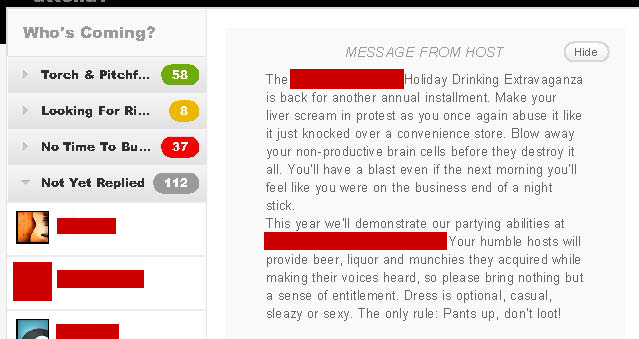 The comments made in reply to the invite are all positive. Invitees think it’s hilarious. This is what’s wrong with St. Louis: People of White Privilege who remain emotionally insulated from the injustice all around them. People unfamiliar with what a majority of the citizens in St. Louis City face each day because of the color of their skin. Or worse, people who do know what is going on, but remain silent. A staffer for a local elected official, someone who represents the official at events on occasion, gave a Yes RSVP to the event. This is what’s wrong with St. Louis: People who talk the talk but don’t walk the walk; People who only give witness to justice and peace when they are on the clock. City Halls, County Courthouses, these are the remaining people’s houses. Forget about the U.S. Capitol and State Capitol. Congress and Missouri Legislature are hopeless. Local. Local is where it is at. Local is where you can still make change. Our cities and counties still belong to us and not the lobbyists. But Police in riot gear now keep people out of their house of government in St. Louis City and all should be troubled by this. It’s not the first time this year that St. Louis City Hall has been put on Lockdown before protestors arrived at the steps. This is what’s wrong with St. Louis: Fear of inconvenience has become grounds to prevent the people from entering the people’s house. Does the City of St. Louis have a responsibility to secure lives and property inside City Hall? Yes. It can require you to go through a security system and ensure you are not bringing weapons or anything else that it deems might cause harm to persons or property. It can also require you to get a permit to hold an event in the building. The City can and should remove you if you prevent others from conducting their license, tax, recording, or other business at City Hall. It can and should remove you if you block exits for escape in the event of a fire. It can and should remove you for using foul language. The City can and should arrest you for damaging property or harming others. It can and should arrest you for laying a finger on another person without their consent. The City can also require you to sign in and out of a building. It can require you to wear a shirt and shoes in the building. It can require you to refrain from activity that common courtesy would otherwise prevent you from doing had we not failed to teach you manners. I have zero problem with any of that. Is an escape from the Justice Center, across the street from City Hall, legitimate grounds to Lockdown City Hall? Absolutely. Is the potential inconvenience of a protest legitimate grounds to Lockdown City Hall? No. I do not think it is. Prior restraint censorship in the people’s house should require a heavy litmus test. And I hope that this issue is debated in this Spring’s 7th Ward alderman race, the other alderman races, and by the Board President candidates. Dotson said he was unsure whether it has been the police commanders on the scene that have ordered the building closed or whether it has been the mayor’s office. That’s a very, very scary statement coming from Police Chief Sam Dotson. We must not allow the police to shut down the people’s house without consent of the duly elected Mayor. We need to know what’s going on here. Mayor Francis G. Slay is City Hall’s landlord. Mayors for decades have griped about what powers they did not have. But there is one thing we know for sure, the Mayor is the landlord of city buildings. The Mayor makes decisions on when to close for inclement weather and should be the only person with the ability to put City Hall on Lockdown. This is what’s wrong with St. Louis. Pass the buck. No one takes responsibility for an unpopular decision or a mistake. It’s another issue for the upcoming Spring election: Who should make the decision and be accountable for the decision to prevent the people from their house of government? *This is by no means a complete list. And, for the record, what’s right about St. Louis, which I tweet about every day, far exceeds what’s wrong about her. 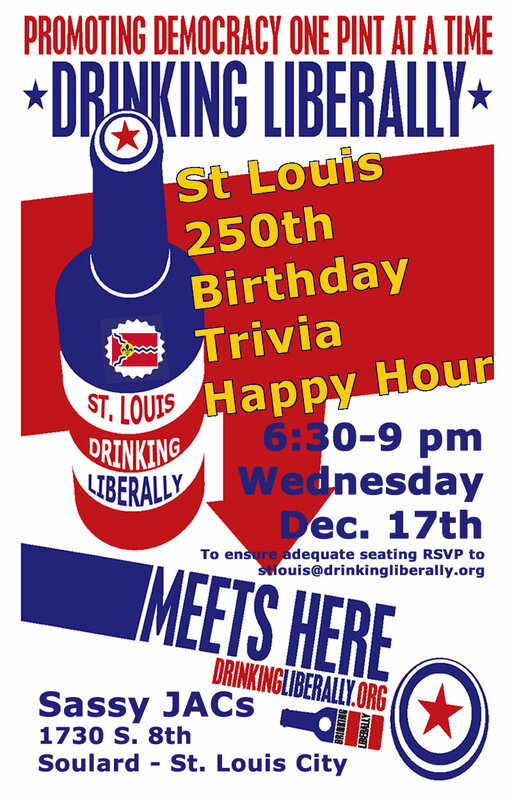 For more information, see Drinking Liberally St. Louis Chapter. Event is co-sponsored by 7th Ward Independent Democrats.